The Flag of South Africa was adopted on the 27th of April, 1994, the same day as South Africa's first democratic election. It was designed by Fred Bronwnell, who was South Africa's State Herald at the time. The flag design process started in 1993, and only 6 designs were chosen out of more than 7000 designs. The flag comprises of a horizontal band of red (at the top) and blue band, on the bottom.ths is separated by a green band that splits in two, having a "Y" shape. A white stripe separates the green and red, as well as the blue green. In the "V" shape of the "Y", there is a black area, and a thin yellow stripe that separates the black and green. South Africa's flag is one of a kind, as it has 6 colours, no emblem or seal. 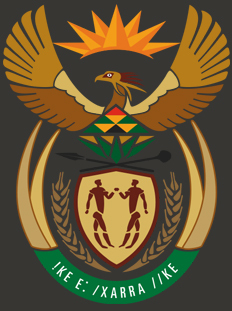 The new Coat of Arms of South Africa replaced the old one that has been in use since 1910. The new Coat of arms was implemented on freedom day - the 27th April 2000. The motto !ke e: |xarra ?ke is Khoisan, and literally translates to "diverse people unite". Out of the country's top 10 designers, 3 designers were chosen for the important task of designing a new coat of arm. Iaan Bekker was the designer who designed the new Coat of arms, and he was chosen by The Government Communication and Information System. South Africa's national Anthem is one of a kind, as it comprises out of four languages, Xhosa, Southern Sotho, Afrikaans and English. It is also a combination of two songs, the first half being "Nkosi Sikelel' iAfrika", and the second half "Die Stem van Suid-Afrika/The Call of South Africa". Nkosi Sikelel' iAfrika was composed in 1897 by Enoch Sontonga. He was a Methodist school teacher and the song was sung as a hymn in church. Later times the song was traditionally sung as political defiance against the former regime. Die Stem van Suid-Afrika/The Call of South Africa was composed in 1918 by C.J. Langenhoven, and it was originally the co-anthem with "God save the Queen" from 1936 up until 1957 when it became the only official national anthem. It was set to music by Reverend ML de Villiers in 1921. Nelson Mandela declared in 1995 that both the songs should be implemented together as South Africa's national anthem because of their great political and traditional meanings to all cultures in this diverse country.